Owning a home has long been touted as the quintessential American dream. But for millions of homeowners, that dream no longer means the freedom to do as they please with their property. In housing developments across the region, homeowners no longer are free to put up fences, flagpoles, pools, decks, clotheslines and lawn decorations at will. Instead, homeowners associations have become the long arm of the law that enforces restrictions to keep new housing developments looking homogeneous. The vast number of new homeowners in Cranberry Township are governed by some kind of association, said Dan Santoro, assistant township manager. "It's the forum that is closest to the people. It is the neighborhood government," Santoro said. "They have become the quasi-government entities that have a lot to say about how the neighborhood appears and will stay." ordinance in the Seven Fields development where he lives. Nationwide, an estimated 40 million Americans live under the realm of homeowners associations, according to the California-based American Homeowners Resource Center. Homeowners associations maintain green space and ensure residents abide by deed restrictions. Those restrictions, called covenants, have grown to include a wide range of prohibitions aimed at protecting a development's aesthetics and property values. Limits can include the size and type of fences; pools; outbuildings, such as sheds; and swing sets. The restrictions can be very specific. In some cases, metal swing sets are prohibited. Only the more expensive wooden play equipment is allowed. Above-ground pools also are a common restriction. Instead, many communities only allow costlier in-ground models. Another common restriction is a ban on parking motor homes or boats in driveways. To preserve property values, many neighborhoods have homeownersgroups that dictate the appearance of homes. 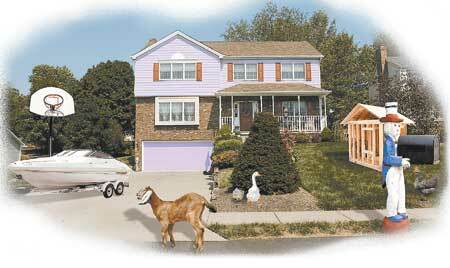 In some housing plans, this fictitious home would have to be repainted, the barnyard animals removed, lawn ornaments and decorative mailbox removed, shed and basketball hoop torn down, boat stored inside and cone-shaped bush reshaped. obtrusive, from clotheslines to lawn decorations. Some go so far as to limit the paint color of shutters and trim. The covenants are part of the deed and pass from one owner to another when the property is sold. Homeowners associations typically are governed by a board of seven to nine residents. Each household gets one vote in an annual election. The length of terms varies. The board collects dues for maintenance, capital improvements and recreational projects. Dues vary from less than $100 per year to more than $1,000 annually. Supporters say the idea is to build strong communities and protect property values. 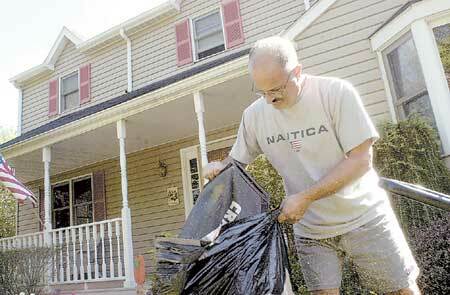 Opponents charge homeowners associations are violating the basic freedoms of property owners. "I hate bureaucracy," said Anthony Testa of Seven Fields. "Every community across the country, you have to answer to the bureaucratic process. Now you have to answer to everybody." Testa moved from New Jersey seven years ago. He sought out a home where he would not be forced to belong to a homeowners association. "I came from one in New Jersey," Testa said. "I didn't like the payment that you had to pay them — $50 a month. It's just another case of somebody getting power over you." Testa said he is not aware of any deed restrictions on his 10-year-old home along Cumberland Road. "I'm glad that I can do what I want to do," Testa said. In neighboring Cranberry, Sherry Kendrick has been a member of the Pinehurst Homeowners Association for four years. "Our primary purpose is to make sure that people stay within compliance of our covenants regarding building and the upkeep of their homes," Kendrick said. "We don't allow things like clotheslines, above-ground pools, chicken wire fence, no accessory structures like sheds." Kendrick, an association board member, said the group is in the middle of litigation with a homeowner. She declined to elaborate. "If someone is violating the covenants, we approach them directly and also put it in writing," Kendrick said. "Normally, we're willing to work with people." Legal action is a last resort, Kendrick said. The association oversees maintenance of the walking trails, basketball courts and playground. The development's 266 homes range in price from $275,000 to more than $400,000. "Not only do these people benefit, but this is for subsequent homeowners, as well, because there is a high turnover in Cranberry," Kendrick said. More than 3,500 residential units have been built in Cranberry in the past 10 years. Eighty percent were single-family homes. The vast majority are part of a homeowners association, Santoro said. Another 20 housing plans are in some phase of development, Santoro said. Homeowner associations will be in place for all of those. The groups are needed to take over maintenance of detention ponds after development is complete. Cranberry Township does not take ownership of those facilities, Santoro said. Township officials do not have the power to enforce deed restrictions. It is up to the courts to settle disputes between homeowners and associations, Santoro said. If a resident meets township requirements for a fence or other permit, it is granted, Santoro said. But township workers do caution homeowners that they need to check with their association before proceeding, Santoro added. "People are willing to and to some extent want to protect the integrity and value of the development they bought in to," Santoro said. "They are willing to subject themselves to that scrutiny."